Jurors reporting the week of April 22--27, 2019. No groups are needed for Monday, April 22, 2019. All groups will need to check this message after 5:00pm Monday, April 22, 2019 for instructions for Tuesday, April 23, 2019. Thank you for your time and have a pleasant evening. Vehicles over 6’10” tall will NOT fit in any City of Topeka parking garage listed above. 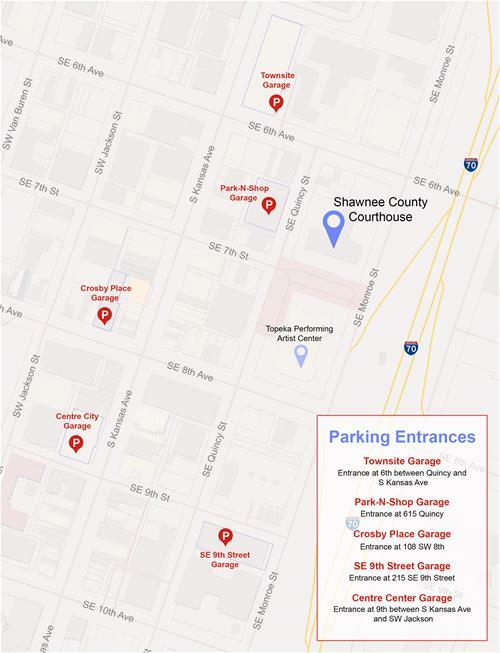 Parking vouchers will be provided for jurors (or potential jurors) parking in any of the above listed garages. The Shawnee County District Court will NOT pay for parking tickets of any kind. I've moved from my Shawnee County residence and no longer reside in Shawnee County. Do I still qualify for jury service? How do I request to be disqualified from jury service?